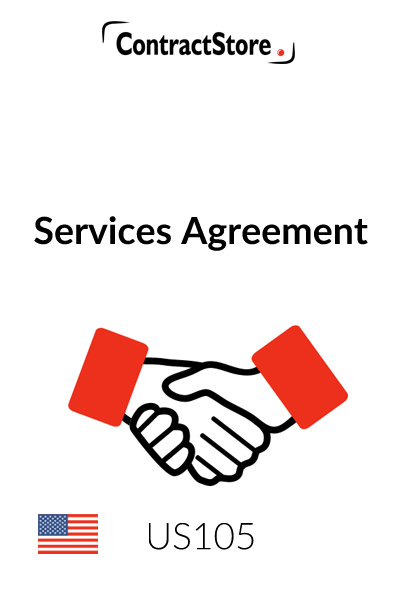 This Services Agreement is designed for use where a company wishes to obtain services from another company or individual. This form is intended for use in any state in the United States, for use by a company wanting to obtain services from another company or individual. 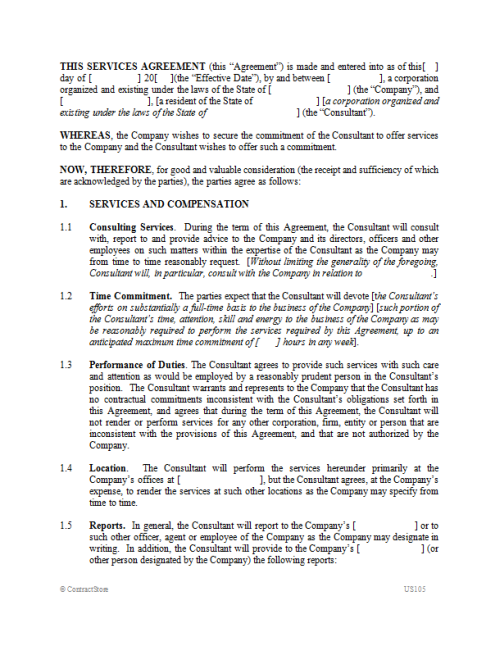 This Services Agreement is designed for use between a corporate employer (the “Company”) and an individual or corporate consultant (the “Consultant”). It can be signed either by an individual consultant or by a corporation or other entity. If one of the objectives of the Company is to avoid an employer-employee relationship with a service provider who is an individual, it can be beneficial from a planning perspective for the consultant to set up an intermediary corporation or limited liability company which then enters into this Agreement as the Consultant. 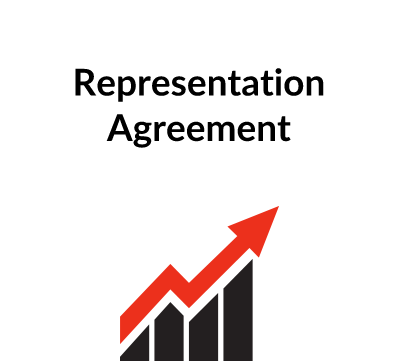 This form provides a good starting point for preparing a first draft of a Services Agreement. However, as with use of any form, it is very important to take the time to read the form in its entirety to ensure that it is customized appropriately for use in your individual situation. For all but the simplest of transactions, it can be anticipated that some customization will be in order; and as mentioned above, it may also be advisable to consult with competent legal counsel. The parties’ names and states of residence/incorporation (as applicable) should be inserted at the beginning of the document. The brackets and bracketed language that is redundant should be deleted. Unless specifically warranted by the nature of the parties’ relationship, no customisation of the recitals is required. 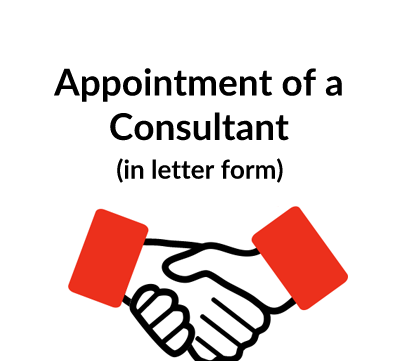 Paragraphs 1.1 through 1.5 contain the basic terms of the consulting relationship. Paragraph 1.1 allows the parties to specify the scope of matters on which the Consultant will be providing services. The brackets and bracketed language that is redundant should be deleted. 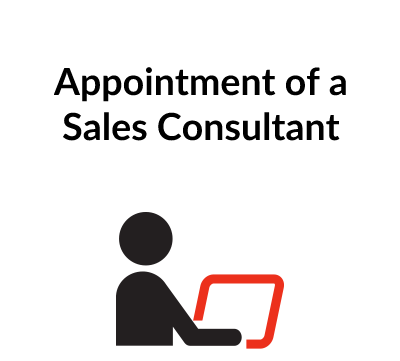 The parties should complete the information in paragraphs 1.2, 1.4 and 1.5 relating (respectively) to the time commitment expected of the Consultant, the location at which the Consultant will render services and the person or persons to whom the Consultant should report at the Company (which is set up to be a title, e.g., Regional Manager of Sales, but which can be a named person, e.g., John Smith). Paragraph 2.1 provides for the compensation of the Consultant – an hourly consulting fee and reimbursement of certain business expenses. Paragraph 2.2 anticipates that the consulting fee will be paid monthly after presentation by the Consultant of a monthly invoice. Paragraphs 3.1 through 3.4 provide that any inventions and other intellectual property that is developed by the Consultant on the Company’s time and using resources provided by the Company must be turned over and assigned to the Company. This is a common provision to include in employment and consulting agreements, and is normally not legally problematic in the context of non-employee consultants. This is a short form noncompete provision which may be adequate in many cases. If more detailed or more extensive protection is required, consider using a free-standing Noncompete Agreement available elsewhere on the ContractStore website (or incorporating the noncompete provisions from that Noncompete Agreement). Note that this provision is expressed to survive termination of the Agreement for the noncompete period (12 months). It is deliberately limited in geographic scope and duration to reduce the risk of challenge on grounds of being “unreasonable”; any increase in geographic scope and/or duration should be the subject of consultation with competent legal counsel admitted in the state in question. Additional liabilities may attach to the parties’ relationship if it is deemed to be an agency, partnership, joint venture, employment or other similar relationship. Paragraphs 7.1 and 7.2 are intended to make clear that the parties are independent contractors and have no authority vis-à-vis one another other than is expressly provided in the Agreement. Paragraphs 7.3 and 7.4 are intended to clarify that the Consultant is liable for obligations relating to its employees. This is “boilerplate” language. Under U.S. law, a person can have considerable exposure for the activities of other persons, and therefore it is common to seek protection from this by way of contract clauses such as this one. Indemnification provisions are customary in contracts particularly where significant liabilities are possible. This is a standard form provision that purports to make each party responsible for any damages caused to the other party as a result of negligence or other misconduct, breach of contract, or claims from certain third parties. Note that this provision is expressed to survive termination of the Agreement, and does not expire by its own terms. This Agreement is set up to be in force for a fixed term to be specified in paragraph 11.1. Upon the expiration of this term, the Agreement renews on a month-to-month basis and can thereafter be terminated by either party with a month’s written notice. Paragraph 11.2 describes some limited circumstances in which one party or the other can terminate the Agreement prior to its term. Note that paragraph 11.2.2 allows termination on an at-will basis upon sixty days notice, which should be reviewed carefully in case it would not be in the interests of one party or the other to allow such an abrupt termination. Paragraph 11.3 provides that certain terms may survive termination of the Agreement, and paragraph 11.4 obligates the Consultant to return certain materials to the Company upon termination. In U.S. litigation, the prevailing rule is that each party bears its own litigation costs (subject to some narrow statutory and other exceptions). The language in paragraph 12.3 is intended to impose the so-called “English rule” to litigation costs. • The force majeure periods in paragraph 13.1 should be adjusted in light of the nature of the Agreement and the term of the Agreement as a whole. • Notice information should be completed in paragraph 13.2. Notice by e-mail could also be added as an option if the parties are comfortable with this method of notice. • Paragraph 13.5 contains a basic non-assignment provision which the parties should review carefully. • Paragraph 13.7 should not be deleted. Most states have moved away from an “all-or-nothing” approach to enforcing illegal or unenforceable contract provisions, and the severability provision in paragraph 13.7 is an attempt to instruct a court to adopt a flexible approach to the Agreement in the event that one or more clauses prove to be illegal or otherwise enforceable, provided that it is still possible for the essential intent of the parties to be achieved.